Get ready for a simple and fun game that involves color cards and a whole lot of fun. Flippin' Out is an easy game to learn how to play and contains a twist - there are four numbers to each card (in different corners and sides of the card). This helps play into how the game is played. Need a little help with your hand? Special cards are included that let you do special things. 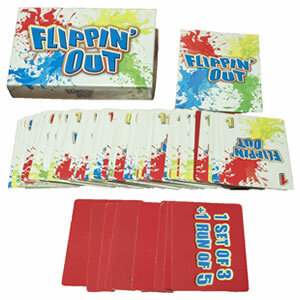 Flippin' Out is a great card game for up to 5 players and won't take a long time to play. Different rounds make up the game and if you have the lowest score at the end of the game you'll win. 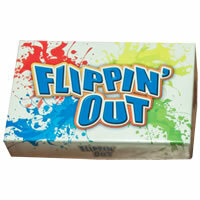 Give Flippin' Out a try today! Review Completed (2018-07-24) Perhaps the goal of this game is to not flip out while playing Flippin' Out. What other card game gives you 40 "different" cards to choose from to complete a run or set? Each player gets 10 cards that are double sided with two numbers on each side. When we first saw this game we didn't realize the cards were double sided too. We just about flipped out! To make things better or worse, depending on how they are played, action cards might make you flip your whole hand or turn them all over reeking havoc on your strategy. But wait, that's not all. Even your melding card that shows what your goal is for the round can be flipped over to reveal a whole new objective. We think this card game is properly named. Our thoughts after playing were "wow that was crazy" followed by a quick "wanna try again?" We liked this game and played several rounds before we finished up. Game play doesn't take forever and we liked how quick it was to learn how to play. The rules are written well and explain how to play in an understandable way. Game play resembles that of various other card games so the main game principles are already understood. The graphics on the cards are simple yet colorful. There can be a fair amount of strategy although it might not profit you anything if someone flips things up. One aspect that we really liked was players get to see half of your hand – the part on the back that they can see. This helps when you want to take one of their cards. One thing that was unclear to us is if you can continue to manipulate your cards during the game or only during your turn. We assumed you could, and we were all shuffling things around constantly and at times shifting our strategy. The game quality is such that it should last for a while. We've seen better quality cards but the ones included are good enough. The box size is small and fits the cards nicely. The rules appearance didn't win an award for being visually stunning and packaged but they got the job done. We'd recommend this game if you want a short, light hearted game that has a lot of fun built into it. Great for parties and families with a wide range of ages allowed to play. Flippin' Out will be a fun one to introduce as a new game and will be quickly loved by most all that play. The player with the lowest total wins. You'll get 101 cards and the official Flippin' Out game rules and instructions. Please keep in mind that the official Flippin' Out dice-card rules and instructions could be different depending on the game version you have. The rules below are some of the exact directions on how to play Flippin' Out. Share with us your comments, funny stories, tips, advice, strategies, creative ways to play, questions about how to play, problems with the rules or anything you want about Flippin' Out. All submissions will be reviewed within 24 hours. Click here to add your Flippin' Out comments.